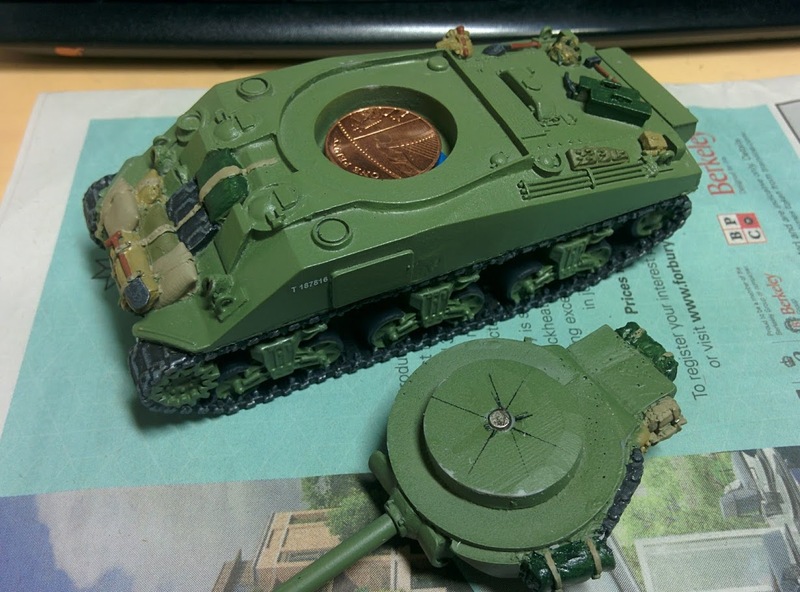 Needing little introduction, this is the tank often called a “Firefly” by wargamers. I’ve already written a whole blog post about why that’s a load of cobblers and nobody called it that during the war, go check it out if you’re wondering why I’m not calling it a Firefly here. Packing the dangerous 17pdr high velocity gun, this vehicle accompanied other tanks such as 75mm Shermans and Cromwells giving a measure of protection against the German big cats, not to mention making very short work of the Panzer IVs and StuGs they normally faced. Shoehorning the big 17pdr gun into a Sherman turret required some engineering sleight-of-hand, and took a few goes to get right. But by mid and late 1944 17pdr Shermans were reaching front line units. There were two main versions, one based on the earlier Sherman I becoming the IC; this kit though is the more common VC based on the Sherman V. Those are Roman numerals, btw, so “five see” not “vee see”. Straight out of the bag. There’s a tiny amount of flash on the tracks, but that’s it. This is an absolutely stunning little model. Detail is plentiful and very crisp, and casting quality knocked the socks off most other manufacturers I’ve used. I’ve reviewed Warlord and Die Waffenkammer resin here before and this makes both look pretty second-rate. This casting had no bubbles, voids or defects whatsoever, and flash was almost entirely absent. After casting some attention had clearly been given to the mating faces of the turret so that it sat properly right out of the bag. This is quality work. Granted, Blitzkrieg’s range is all resin so more expensive than plastic from the likes of Warlord or Rubicon, but I got this vehicle in a half price sale where it actually worked out cheaper than plastic anyway. I wouldn’t hesitate to recommend Blitzkrieg to anyone if the two vehicles I’ve bought from them are the standard they always produce. The kit is four parts: hull, turret, gun and commander’s hatch. The latter is separate so you can model it open if you want, the gun required a 30 second touch up and then fitted snugly into the mantlet. All these parts are resin, you get no metal in the kit. Detail is good, and the vehicle comes moulded with a fair bit of stowage, piled on the glacis, rear deck and turret. This is brilliant for a vehicle you’re only likely to field one of in a platoon, I’d be less keen on identical stowage for regular Shermans. 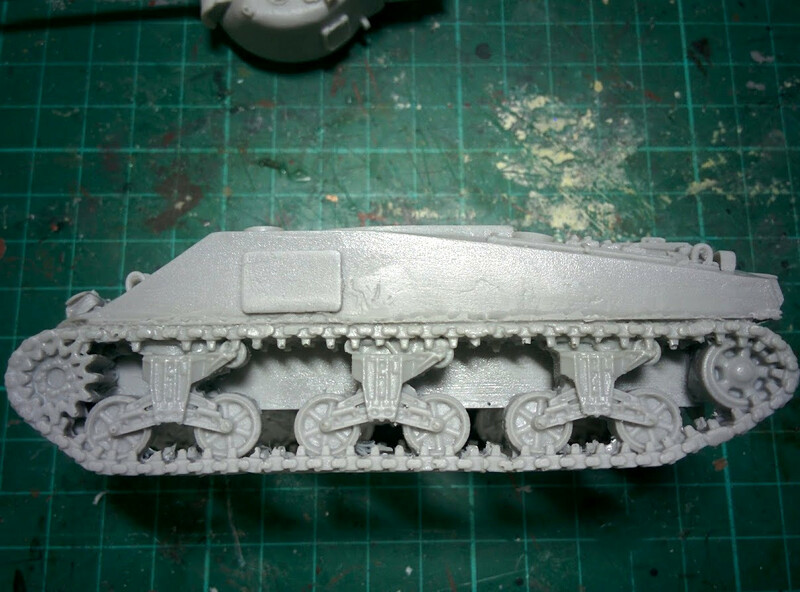 It’s not clear if their 75mm tanks also have stowage, because the picture on Blitzkrieg’s site actually shows this model with no stowage either! I normally add something from my bits box to every vehicle I paint, this one didn’t need it as it was covered in track links, pieces of web kit, helmets, tools, etc. The only slight alteration I made was to magnetise the turret. Apart from that it took about two minutes to assemble, and only a few more to clean off the near-zero amount of flash from the tracks. All my other Shermans are painted with NZ markings, but I can’t see myself using it for Italy games much as they didn’t get the snazzy 17pdr tanks until late in the war and they didn’t see much fighting. So Polish markings it is. Polish 1st Armoured used plenty of VCs after the Normandy breakout, and saw enough action in the running battles through the Low Countries to make it a sensible choice. Plus that winged hussar divisional symbol is just so cool it’s hard to resist. Painting was my usual recipe: cheap car plastic undercoat from Halfords, Army Green basecoat, then pick out the tracks and stowage. I pinwash all my vehicles with black ink to bring out the detail, blend the whole thing with a coat of Army Painter strong tone ink, drybrush a surprisingly lurid green and then use some Tamiya Weathering powders to grotty it up. Andy, thanks for the article post.Really thank you! Great.